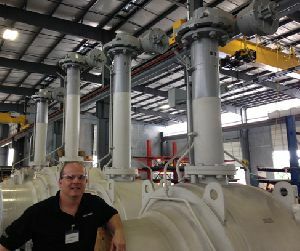 Caught on camera at the Houston headquarters of global valve distributor Lockwood International, Rotork’s Donnie Anderson couldn’t fail to notice this impressive combination of trunnion mounted ball valves fitted with Rotork IW Series manual gearboxes. The gearboxes, which are stocked by Lockwood, are operating the valves via stem extensions that are fitted when valves are going to be installed underground or in out of reach locations. IW Series gearboxes are designed with customer stocking in mind, featuring a removable output sleeve to facilitate machining. The combination of a separate output sleeve and base plate provides the maximum flexibility for on or off centre mounting on the valve without additional modifications. The totally enclosed, sealed and lubricated for life enclosure is available with IP67 or IP68 environmental certification and is suitable as standard for an operating temperature range of -40ºC to +120ºC (-40ºF to +250ºF). They are one of a number of Rotork Gears products stocked and distributed by Lockwood, who claim to maintain the largest valve stock inventory in the western hemisphere at 25 strategic locations.